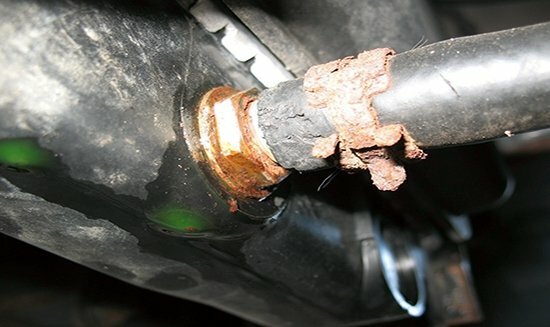 Ordinary leaks are easy enough to diagnose because they’re hard to miss. A leak of any size at all will weep, drip or spray coolant. The resulting loss of coolant usually leads to engine overheating, which can cause more damage if the leak isn’t found and fixed. Leak inhibiting additives can usually seal small leaks. But sealers are a temporary fix and more of a do-it-yourself product. Even so, some professionals recommend using a sealer for preventative maintenance and to prevent or seal porosity leaks in aluminum cylinder heads. Some types of sealers, though, may increase the risk of deposits forming in the cooling system, which could cause radiators clogging – especially if the cooling system is overdosed with such a product. Leaks caused by internal corrosion may be found almost anywhere on radiators. The most vulnerable points are usually the seams and where the tubes are joined to the headers. The underlying cause is almost always cooling system neglect, but it may also be due to bad ground connections between the engine, charging system and vehicle body. If the coolant has been changed regularly and tests good, check the engine’s ground connections and clean and retighten as needed. Leaks caused by punctures in an otherwise health copper/brass radiator can usually be patched by soldering, brazing or even sealed with epoxy or specially-formulated high temperature hot-melt adhesive (which is not the same kind of adhesive used in a home hot glue gun). If the radiator is full of corrosion, though, a patch is not going to last. The radiator will have to be recored or replaced. Let our years of radiator repair service at Triangle Radiator & Auto Service provide you with the radiator repair service you need to get your engine performing at its best in Chicago and the surrounding areas. Contact us to schedule your car radiator repair or other auto repair service. Triangle Radiator & Auto Service is proud to be your local auto repair shop in Chicago.